Since the Homeschool Music class is intended to be a more academic class (versus the focus on music-making and pre-piano skills of the Piano Readiness Class), we are studying a composer each week. I let them color a coloring page of the composer while I read a simple biography. Then we listen to a famous composition and complete a worksheet that I create about the composition. 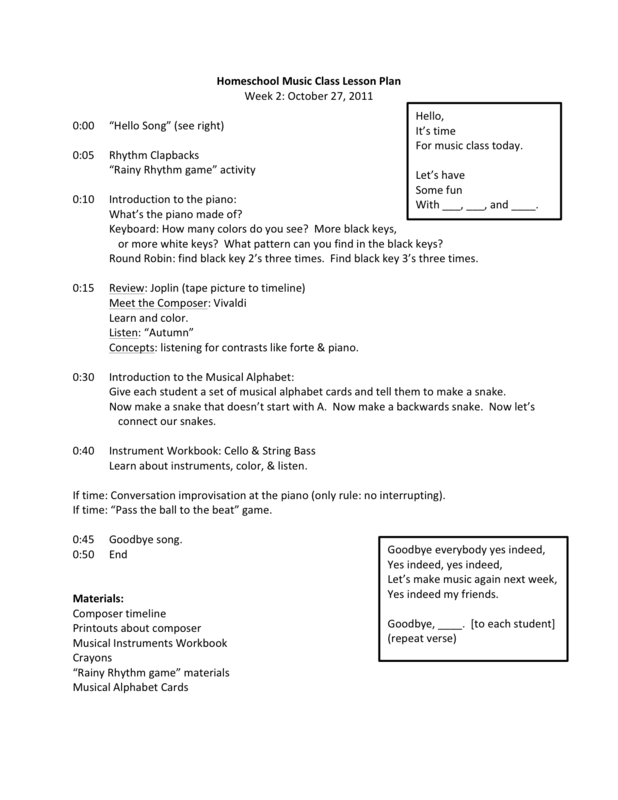 Printables mentioned in this lesson plan: the Rainy Rhythm game, the Musical Instruments Workbook, and the Musical Alphabet cards. That pretty much sums up my method of lesson planning. If you have questions or your own tips about lesson planning, share them in the comments! Thanks! What tunes do you use for your hello and goodbye songs? An important thing about lesson planning is being able to think big (plan ahead for following weeks, so you can work your way towards your semester-end goals) while also thinking small (breaking down those goals into manageable pieces that you can teach gradually!). Think about the concepts you want to teach each week, and then come up with activities that will teach those concepts to your students. Singing — Find some simple songs to teach them, like a Hello and Goodbye songs. There are lots of other cute preschool songs and fingerplays on YouTube. I love “Three Speckled Frogs,” for one. Rhythm — for the first week, I’d probably focus on a finding-the-beat game (have them walk in a circle to music excerpts). Then, I’d try some simple rhythm clap-backs to develop their ear. Notation — The Rainy Rhythm activity linked to above is a great introduction to rhythmic notation. Listening — Listening for high/low sounds. Or, you could focus on loud/soft. These activities should be listening based, but also movement based! For example, you can have students stand with their arms in the air when they hear loud (or high) sounds, and crouch down to the ground when they hear soft (or low) sounds. Piano Skills — I would probably start with learning finger numbers. There are songs about the finger numbers on the Music For Little Mozarts CD and the Faber My First Piano Adventure CD. Later, you can learn hand shape and wrist motion (Faber has some other songs that are great for this). Piano Topography — Learn the black key groups of 2’s and 3’s. I hope that helps! Let me know if you have other questions. Good luck with your new class!! Could you please share any tips about organizing group classes. I’m well familiar with setting up individual lessons, but I’d like to expand by starting group classes too. I find it challenging to announce group class, but when I have one student interested and then no other signs up, I end up with a “group class” for one student. That ends up with very low cost for the student and very low income for the teacher. Thank you in advance for sharing any tips or ideas.